Giving them logical reasons on how to overcome anxiety won’t help. Logic alone can’t change chemical and physical reactions. Expecting logic to fix those symptoms is like expecting logic to cure a cold. It’s not only unreasonable, but also doomed to fail. People with anxiety are constantly bombarded by well-meaning advice to calm down or take a breath. That's not how to help someone with anxiety. Instead, it makes the person feel judged, which only makes the anxiety worse. Tell the person that you understand he or she can’t control the anxiety and that it isn’t his or her fault. Acknowledging that the anxiety isn’t something they’re doing, but something they’re enduring can help relieve them. Whenever possible, acknowledge your own experiences with similar thoughts. Anxiety is debilitating for some people, and drugs or alcohol can relieve the symptoms. The problem is that it’s only a temporary fix. Drug and substance abuse can make the anxiety worse over time. To avoid the worsening symptoms, the person drinks more and more until drinking becomes its own problem. One answer to how to help someone with anxiety is to intervene before the drinking gets out of control. This is probably the best answer to how to help someone with anxiety. No matter how good your intentions, you probably aren’t trained to help someone manage their anxiety. Even if you have training, you’re too close to the situation. 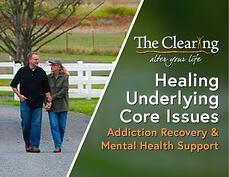 What they need is an objective therapist or an emotional stability program at a high-quality rehab center. Helping someone with anxiety is often hard because it’s not something they choose. It’s something that is happening to them like a disease. You can help them by being accepting, not expecting logic to fix it, and watching out for substance abuse. Most of all, you can help by encouraging them to seek help from professionals. Located on San Juan Island in Washington State, The Clearing offers dynamic mental health and addiction treatment options grounded in Spiritual Psychology. Don’t let anxiety run the lives of your friends and loved ones. If you have questions about how to help someone with anxiety, call The Clearing today at 425-275-8600.